When on a summer holiday to Golden Sands, you mustn’t miss some of the attractions of the area. Our resort reps can arrange a number of daytrips from your hotel in Golden Sands, for example an excursion to the old fishing village of Sozopol with its famous wooden houses including a visit to the stunning Ropotamo River. You can book a tour to the breathtaking Blue Mountains, you can take part in thrilling Jeep safaris, or enjoy leisurely daytime cruises. If you fancy, you can step on another continent in Istanbul. You can spend traditional Bulgarian nights at local villages, attend folklore nights at the renowned Khan’s Tent. 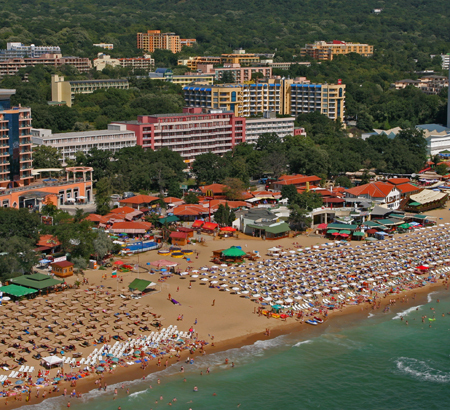 Have a look at our outstanding value for money late deals to Bulgaria to book your summer holiday to Golden Sands. Once in resort, do not forget to ask your local rep for more information about our fantastic excursion programmes.